Nowadays people are not only struggling with flash flood crisis in Iran but also they are strangled in the snow, blizzard, and cold in some regions. The flash floods engulfed the northern provinces of Iran as the New Year began. Then, a vast area of Shiraz City flooded, which left enormous casualties and damages. After that, the Southern provinces were exposed to the flood crisis in Iran. Regime’s inaction to contain the floods or their aftermaths added to people’s pain and suffering. It was only the people who rushed to rescue and help their compatriots. The residents of Sarpol-e-Zahab (W), though still leaving in trailers two years after the earthquake there- and that too because of the regime’s inaction- offered their help. While the mullahs’ regime neglects to provide relief supplies for the flood victims, a little Azeri girl donated her New Year’s gifts to the Turkman people in Golestan Province. 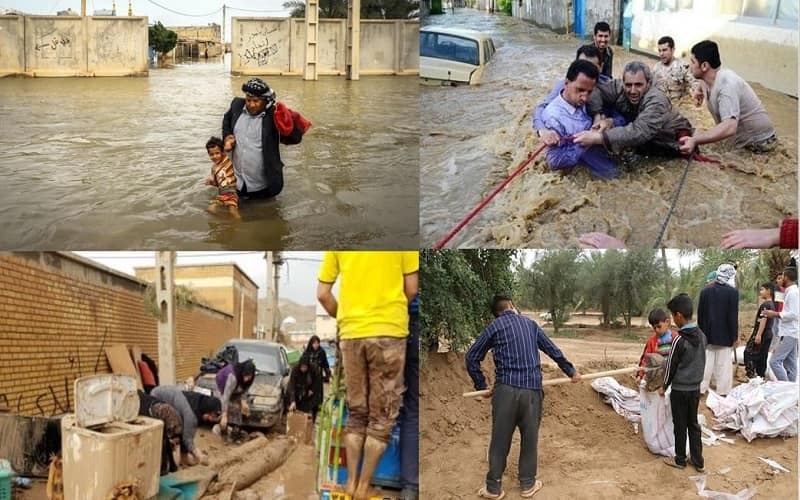 In Shiraz, despite losing all their belongings in many parts of the city, the people did not hesitate to help the travelers on Nowruz holiday who were .trapped in the flood there. Many people in Shiraz, installed signs in the streets, inviting Nowruz travelers to their homes and restaurants for free and provided supplies for them. Many people in the northern towns who were less affected by the flood rushed to save the people of Golestan Province, particularly Aqqala and Turkmen Sahra Region. In popular solidarity, locals in Golestan Province built a 4km levee with simple material to prevent another flash flood. How did the regime reacted to flood crisis In Iran? For the mullahs, the priority is keeping their grip on power, rather than people’s lives and assets. So, after the flood in Shiraz, to prevent popular protests, the IRGC’s armored vehicle entered the city and begun patrolling instead of dispatching aids. Also, in the Northern provinces, armored carriers were dispatched to various parts of the Golestan province, inciting more popular anger against the regime. On the other hand, the regime even banned contributions through social media. Tehran’s police chief announced that more than 40 sites and social networks’ admins who had run campaigns to collect aids for the flood victims were summoned and banned. Mohammad Jafar Montazeri, the regime’s Attorney General, warned that publishing “fake news” on the recent floods and the scale of damages must be considered as a security issue and the police must prosecute the sources of the publication of false news. The Revolutionary Guards (IRGC) of the mullahs’ regime has voiced grave concerns regarding the revelations made by the Iranian Resistance, the People’s Mojahedin Organization of Iran (PMOI/MEK) and people’s anger in particular, over how the mullahs’ destructive policies are to blame for the vast floods raging across the country. The mullahs believe that meddling in Syria, Lebanon, and Yemen guaranties their security in Tehran. So, neglecting the people of Iran and the conditions they are striving in, they have spent all the national resources to stoke wars in those countries. Therefore it is not surprising that the regime plays with people’s lives during the flood crisis in Iran, only thinking of preventing it to turn into an uprising. This disaster proves that the ruling mullahs’ criminal 40-year policy of plunder and pillage has taken a heavy toll on the lives and livelihood of our people in every flood and earthquake.